The Air Traffic Management Bureau (ATMB) of the Civil Aviation Administration of China (CAAC), the Civil Aviation Department (CAD) and the Civil Aviation Authority of the Macau Special Administrative Region (AACM) entered into a Memorandum of Co-operation after a meeting in Macau today (July 13) to further enhance the efficiency of air traffic management in the Pearl River Delta (PRD) region. The meeting, attended by delegations led by the senior management of the three parties (the Director-General of the ATMB of the CAAC, Mr Che Jinjun; the Director-General of Civil Aviation, Mr Simon Li; and the President of the AACM, Mr Chan Weng-hong), was convened in accordance with an agreement signed in May last year on establishing a strengthened liaison mechanism to enhance co-operation and exchange among the civil aviation authorities of the three sides. 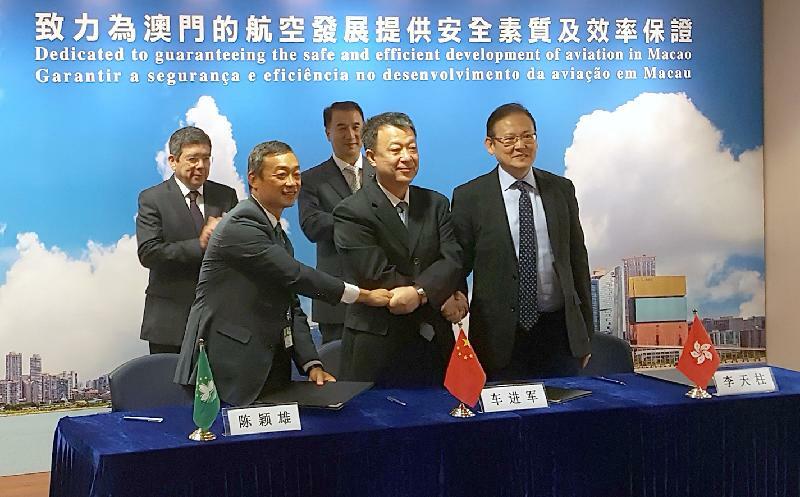 The Deputy Administrator of the CAAC, Mr Dong Zhiyi, and the Secretary for Transport and Public Works of the Macau Special Administrative Region, Mr Raimundo Arrais do Rosário, also attended the signing ceremony to witness the signing of the Memorandum of Co-operation by the three sides. (5) initiate modelling and simulation of the airspace and air traffic in the Guangdong-Hong Kong-Macao Bay Area by using advanced technology to provide reliable, precise and detailed analysis for planning and formulating air traffic management procedures and measures. This will provide data and technical support in airspace optimisation for the construction of the Three-runway System (3RS) at the Hong Kong International Airport (HKIA) and the sustainable development of the Macau, Guangzhou, Shenzhen and Zhuhai airports. Mr Li said at the meeting that the 3RS development at the HKIA has been receiving full support from the relevant Central Authorities at ministerial levels. The Memorandum of Co-operation signed by the three sides has provided a myriad of ATFM measures to promote air traffic management efficiency in the PRD region, which will help achieve the ultimate target runway capacity of 102 air traffic movements per hour under the 3RS operation at the HKIA. On the other hand, the development plan for a city cluster in the Bay Area has provided a development opportunity for the airports in the area. The three sides agreed to use advanced technology to further take forward the study and planning of the Bay Area airspace optimisation, to achieve greater synergy and to create an airport economic belt with international influence. Mr Dong said that the civil aviation authorities of the Mainland, Hong Kong and Macau have all along been working closely together to carry out planning and co-ordination work on airspace in the PRD region. In future, driven by the concept of "Innovation, Co-ordination, Integration and Mutual Benefits", the three places will strengthen co-ordination in light of different strategies like the Belt and Road Initiative to foster mutual development. Cooperation and interconnection between the three parties in the civil aviation field will be enhanced to enable the HKIA and other major airports in the Guangdong-Hong Kong-Macao Bay Area to maximise their potential.